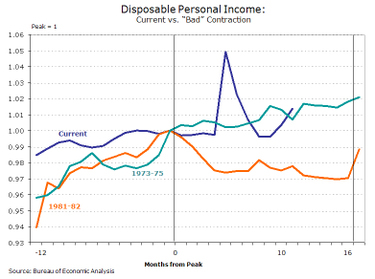 Good news in income growth? One of my New Year’s resolutions is to be more consistent in responding to questions and comments from the loyal readers of macroblog. Though it remains the case that time constraints prohibit a response to all worthy queries, we’re still listening. Next year we’ll endeavor to give a shout back just a little more often. A cursory examination of the monthly trends in real disposable income in light of the NBER official business cycles suggests to me that a sustained rise in disposable personal income (at least three if not four months) signals the end of the recession is at hand. In that real disposable income rose in October and November how are we to interpret this amidst the dire economic forecasts for the coming year? As in the previous post, “time 0” represents the peak of a business cycle, or the month a recession begins. The average length of US recessions from 1960 through 2001 was 10.7 months, so the line indicating 10 months from the peak roughly coincides to the end of the average recession over this period. On average, Robert’s conjecture looks right on track. 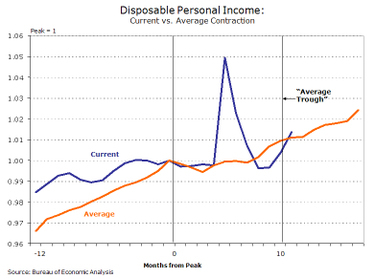 In the typical case, growth in real disposable income stalls and then begins to pick up three or four months before recession’s end. 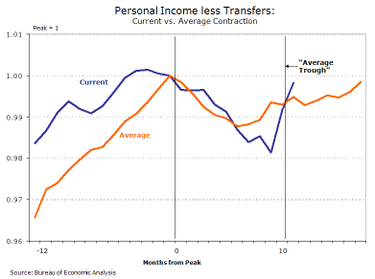 If you smooth through the spike associated with the stimulus package of late spring, income growth was roughly flat through August but has increased since (and at a reasonably good clip). That would seem to portend well for all of us—and I assume it is all of us—hoping for a sooner rather than later end to the current contraction. 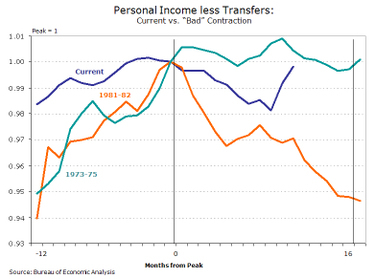 In these two recessions—which are arguably better benchmarks than the average at this point—income measures were not such reliable harbingers of expansion. Still, in current circumstances a glimmer of hope is better than nothing.